25% off everything, and FREE delivery! These are perfect drums for schools and community groups, at the best prices you will find. Simply choose from 6 small, 6 large or 24 mixed size drums. Looking for different quantities? Message us here. Let us know if you would prefer to receive an invoice first, or for other instrument enquiries. Delivery is usually within a week from checkout. All our drums are made from sustainable mahogany. 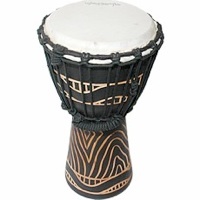 These medium drums have a 9.5 inch diameter head and are great for younger children. You receive six drums from the designs shown. These larger drums are the size played by professionals. They sound great, and we love to play them. You receive twelve drums from the designs shown. Further reductions! 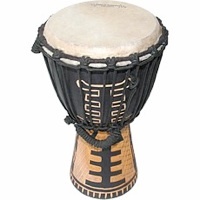 Our best deal when you buy this pack of 12 large and 12 medium sized djembes. Details as above.